I went kite fishing with my son Carl at Muriwai Beach last Sunday. Carl is six years old and loves to go kitefishing with me. I have a Flexiwing Dropper Rig set up on my gamefishing rod and was fishing about half a kilometre north of Rimmers Road. We caught two snapper, a gurnard and one hammerhead shark on our first set of eight hooks. 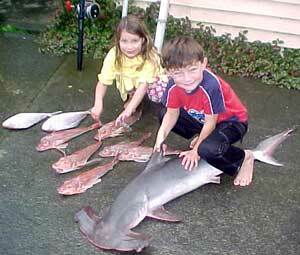 The hammerhead shark weighed 27lb and was taller than my son when hung up. On our second set we caught five gurnard which we were very pleased with. We were using mullet for bait and really enjoyed being able to fish on the west coast for a change. We had a few traces busted off during the day by what I suspect were sharks. Tim Gerard from the Kite Fishing Club has helped me set up my rig and it works really well. I have exactly the same set up as Tim and find the Flexiwing Kite is very effective on my big rod and reel. Above : Closeup pictures of a hammerhead shark caught on a kitefishing rig at Muriwai Beach. Carl Dukes and his sister were obviously excited with the catch. Carl is itching to go kitefishing again and he has kept the jaws of the shark as a trophy. There was a northeasterly of 15 knots blowing last Sunday so I just had to get out on the west coast with my Bottom Longline Rig. Alan Place and I headed out to Glinks Gully and put the rig out to 1000 metres. All 25 hooks were baited with my special salted mullet. When we tried pulling the line in it was extremely heavy even though we were using the power winch. Sharks were the problem but we did see several good sized fish swimming close to the shore. Total catch for the day was one huge kahawai that weighed 2.4kg, one snapper at 1.5kg and a four and a half foot long shark. We lost 18 traces in a row and suspect this was due to the sharks. We decided to shift to another part of the beach but the northeasterly had died away and a seabreeze had come up, so we left for home. Before we left I spoke with another kite fisher further up the beach. He had put out 25 hooks and all 25 traces had their hooks bitten off. I hope next time the northeasterlies come around there will be no signs of these sharks about. I suspect the sharks are around in large numbers judging by what happened to us and the other kite fisher. Ed: Suggestion for anyone going fishing on the west coast- put out a test run of half your normal hooks first and only do a short set (10 to 15 minutes stationary time) to find out if the sharks are around. Sharks often travel in dense schools at times. Talking to other fishers on the beach can also help you to find out where the sharks are. Further north at Ninety Mile Beach one kitefisher set his gear out and caught ten snapper on his first set of the day. They were all good fish up to 5 kilos in weight. While he was on the beach another kitefisher waded out into the clear water and had schools of gurnard swimming around his feet. This is exciting news for those looking for somewhere to kite fish this weekend. We have heard some great reports this week from the west coast including Graham's story above. It has been reported that there were 50 to 60 kites being used on Muriwai on Sunday. Where are your beach reports? We would appreciate some more reports from people who were on Muriwai last weekend. No doubt there were plenty of snapper and gurnard catches on the day. If you've been fishing use the following link to tell us all about it. We were very fortunate last night to see a 20lb snapper that had been caught at Tiritiri- Matangi Island off the end of Whangaparaoa. It was caught using a 5/0 Target Snapper Hook and took 25 minutes to land on 6kg line off a rod and reel. We will have photos and the story next week. We spent five days at Bryans Beach in Whakatane at the end of October. I fished every day except one, due to bad weather and rough seas. On the last day I towed my kontiki longline out to 1000 metres using my kayak. I left the line out for two hours and pulled it in with the help of my first mate (wife) and two friends that were visiting at the time. The first fish to come in was a spotted dogfish about one metre long, then there was a 6.2 kg snapper and finally a 2 kg snapper. This was great fishing. The sea was so calm I decided to put my short longline out as well. I set it 300 metres out but we didn't catch anything on this set. Over the four days of fishing we caught seven snapper, eight gurnard and a shark. Roll on the next holidays. Ed: Look forward to seeing the photos, you can email or post them to us. We spent three days fishing at Waihi in the Bay of Plenty two weeks ago. There was no wind at all so we resorted to using the submarine to get the gear out. Fishing when the tide was dropping we caught three snapper and nine gurnard. We put out four sets of 16 hooks and all were baited with salted bonito. We really enjoyed the time at the beach and the fish for dinner. P.S. In our fishing report I omitted to say that crab pots have been set off the beach at Waihi, mainly in front of the surf club. Please note that they have white buoys and are hard to pick out in the 15 to 25 knot wind and choppy sea. Binoculars are essential under these conditions. They appeared to have been removed prior to the weekend. Ed: Thank you for this information, it is very helpful for everyone. I go surfcasting every day I can at Granity and Hectors Beach on the west coast of the South Island. I recently went fishing at the beach beside Highway 67 towards Mokinui. Using squid for bait I caught two snapper, three kahawai and four other fish. There was a moderate southeasterly blowing and the sea was slight. An awesome day to be fishing. I am a beach longline fisher from Tauranga in the Bay of Plenty. I am going up to Ngunguru for the Xmas holiday and I would appreciate it if any readers can give me some pointers on what to do off the beaches in that area. I did a late night set at Uretiti Beach a couple of weeks ago. I caught one snapper weighing two kilos and was looking forward to more. Unfortunately the wind died away so I packed up and left the beach. 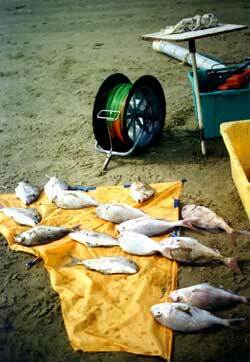 A northeasterly wind is really good for kite fishing at west coast beaches, particularly Baylys Beach near Dargaville. Baylys Beach, like many others has high sandhills and this can cause wind shadow problems when trying to launch a kite. It pays to launch your kite up to the flag in clear areas. On Baylys Beach there is a very good clear area near where you drive onto the beach. When deciding where to fish look for a gap in the sandhills or alternatively run the kiteline out and walk it up the beach till you find a clear area. Put the brake on the reel and launch from there. It is so much easier doing it this way. A couple of years ago when I was fishing on Baylys Beach I had a large gap in the hills behind me and had no problems with launching the kite. Another kite fisher further down the beach spent over an hour trying to launch his kite and only managed to crash it into the sand every time. I noticed what was happening and it was frustrating to watch so I went down to him and suggested I take his kite into some clear area. He was very agitated by this time and was happy to try anything to get his kite to fly. We took his kite up the beach and launched it in the clear, right up to where the flag came off his reel. The kite went up first time, steady and straight. He was amazed and very relieved. I returned him to his fishing spot and his enthusiasm for kitefishing took a turn for the better. Even better was the big smile from his wife, more relief than anything else I think. The kite went straight out and his 25 hooks disappeared into the water in no time at all. When we had finished fishing for the day we stopped by and helped them retrieve their line. The line was full of snapper, gurnard and two trevally. Needless to say they were pleased and couldn't thank me enough for helping out. I hope this is a handy hint for the people who are new to kitefishing. It can save you a lot of time and effort. While at the Tauranga Boatshow last weekend we had the opportunity to discuss Rule 91 with the Maritime Safety Authority (MSA) representative Jim Lott. He agreed with the advice we gave in newsletter 40 regarding keeping your gear safe and not impeding vessels. If you missed the article in last week's newsletter please read it and familiarise yourself with the regulation. The following is an extract from last week's newsletter. "Paul's Fishing Kites will be closely following the implementation of rule 91 and will keep you informed of any developments. In the meantime use common sense, avoid fishing in areas near boat ramps, navigation channels or where other recreational activities could cause conflicts and ensure your gear is clearly marked. If you see a trawler heading towards your gear, haul it in. Trawlers only travel at around four knots when fishing which should give you plenty of time to get out of their way. Above all keep a good lookout!"